Who am I? What am I? What is this life all about anyway? These are some of the oldest questions and surely to be the most enduring. And hey, I don't claim to have the answers but I believe perhaps the answers are more simple than they might appear. I was listening to the radio the other day and one of my favorite bands summed it up nicely. Seems like Zeppelin is talking about the meaning of life being the realization that we are all connected. It's easy to sing about this stuff, but where's the evidence? Modern science is finding some. From Dr. Lee Warren's Connectedness and Gary Zukah's book, The Dancing Wu Li Masters, the field of atomic physics called quantum mechanics states: "…all things in our universe (including us) that appear to exist independently are actually parts of an all-compassing organic pattern, and that no parts of that pattern are ever really separate from it or from each other." 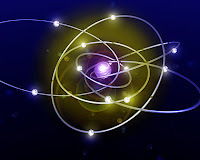 Furthermore, experiments proved that when twin subatomic particles were emitted from an excited atom and traveled in opposite directions from each other, any change in one particle was instantaneously reflected in the other particle. In fact, when studying quantum physics it appears that light particles have consciousness. And if light itself has consciousness, than wouldn't everything possibly? Okay interesting, but what does that mean? Does it really indicate a bizarre connectedness within the very atomic particles that appear to be separate entities? Perhaps. If these ideas are interesting to you, then I believe you'd like these novels too. The Little Universe and Jim's Life are new age, metaphysical and deeply spiritual novels that are full of surprising twists and fun for readers from almost any background. They inspire you to think about this very subject, the concept that we are all connected, a concept which might be the fundamental lesson of this existence (our lifetimes) as to answering these questions: Who am I? What am I? What is this life all about anyway?